One of the greatest disadvantages of machines is that they always break down. Whether you have PC or a simple portable device, you’re likely to lose your data any occasion. There is a great likelihood that your hard drive could become corrupted or simply hard to access. Well, in any event of such a catastrophe,MiniTool Power Data Recovery should always come in handy. Thanks to this software, you can very easily salvage and recover any lost data from your devices effortlessly. The software comes with tools that enable recovery of data from all types of devices that can store data including flash disks. For the similar software, there is always the likelihood you might get your data back but it might not be usable. However, with the help of MiniTool Power Recovery, you get the best chance of getting all your lost data back without any hassles. What exactly does the MiniTool Power Data Recovery application? Upon installation of the program, you will be warned not to install the application on a hard drive partition where the data was lost since this may lead to permanent loss of data. If you have a separate partition, it’s safer to install the application there. Once installation is complete, the front face of the application displays 5 colorful modules which serve as the basic functions of the MiniTool Power Data Recovery software. Each of these modules comes with a segregated function which is almost similar to the next one but a tad different. To start, the ‘undelete recovery’ module key focus is the recovery of any deleted folders or files whether deleted from the recycle bin or permanently deleted from the computer. The next module which is the Damaged Partition Recovery is the most powerful of the bunch and recovers lost data from damaged partitions or recently formatted disks. This works effectively as long as the partition is not deleted. The next module is the ‘lost partition recovery’ which specifically recovers data if the partition in question is lost or accidentally deleted. Losing a partition or accidentally deleting one happens especially occasionally after reinstalling of Windows OS. There is also the module referred to as ‘Digital Media Recovery’ which helps recover data when you’re using digital media including memory sticks, flash disks, memory cards etc. Another function dedicated to this module is also the recovery of digital data including music, videos, photos etc. 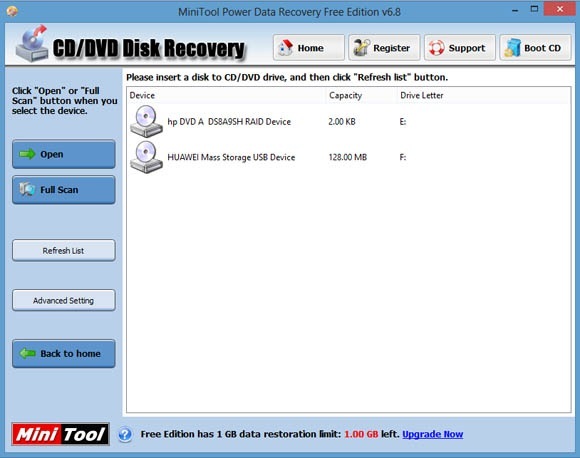 The last module which is the CD/DVD recovery, recovers any lost data from CDs and DVDs. These may come in different types and formats but the module accommodates them. It’s advisable to only use this application only to recover data rather than testing it by intentionally deleting your data or partition especially if you’re not sure how to operate it successfully. 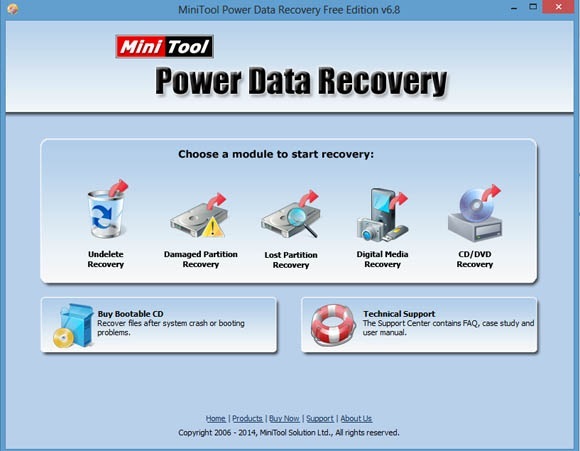 What are the pros of MiniTool Power Data Recovery? The simple user interface is very friendly even for beginners. Once you install the application and start using it to recover data, all the wizards will guide you every step of the way. As such, there is no training required to operate the software. The application provides a Free Edition which offers up to 1GB data recovery which is actually a large amount of lost data recovered. If you need to recover more data, you can always upgrade to the paid version of the application. Compared to other similar applications in the market, the MiniTool Power Data Recovery has stood the test of professionalism and strength. Unlike other applications whose functions are limited to recovering lost files, this one goes a step further to recovery any lost data from recently formatted or damaged hard disks and partitions. The recovery function is not limited only to RAID devices and hard disks but also extends to other data storage media like DVDs, CDs, memory cards, flash disks and also memory sticks. Another great advantage of this application is the fact that it recovers data from a wide range of data storage media and not only restricted to PCs. Thanks to the application, you can recover data from external storage devices including memory cards, flash drives etc. One of the main disadvantages of the MiniTool Power Data Recovery is that the Free Edition is limited to only 1GB. Therefore for users who want to recover a larger size of data, it’s necessary to buy the upgrade. Related to "Free File Recovery Software – MiniTool Power Data Recovery 6.8 Review"